A quail is a small bird weighing only 150-200g. Whilst they are found throughout Europe, debate continues as to whether quail is classified as game or poultry. A more flavoursome bird than chicken but milder in comparison to other game birds, one quail would be ideal for either a starter or as a lighter main course. 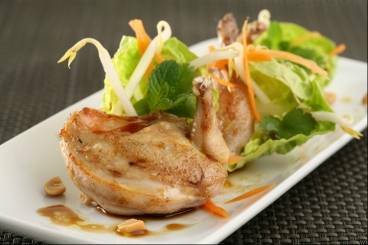 Soy marinaded quail served on a bed of carrots, beansprouts and lettuce with soy vinaigrette and peanuts. 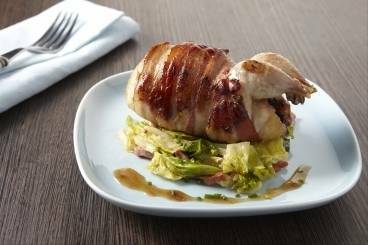 Whole roasted quail wrapped in smoked bacon served with savoy cabbage and lardons. Roasted spatchcocked quail glazed with jus and served with an apple, watercress and walnut salad. A rustic French classic of quail, frisee lettuce, lardons, walnuts, croûtons and fried quail egg.